Heavy duty equipment operators and fleet owners have seen extreme benefits and cost savings from using Evans waterless coolants. Large equipment can experience big problems with traditional coolant—Evans Heavy Duty/Industrial waterless coolant can solve them. For use in classic car engines primarily fabricated from cast iron with carbon steel, copper & aluminium components. * Evans Waterless Engine Coolants have been proven to last >20 years and a million miles in service without the need for replacement. Evans Waterless Powersports engine coolant, available in a half-gallon bottle, is designed for powersports racing, motorcycles, ATVs, UTVs and snowmobiles. It has been used by race teams around the world for years to keep their engines safe, no matter what the conditions. 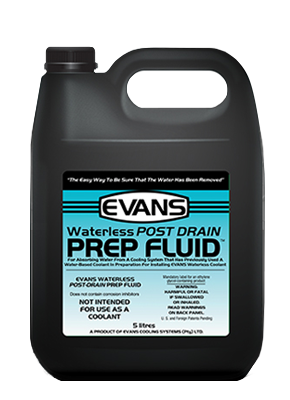 Evans Prep Fluid is a waterless cooling system flush engineered specifically to purge the cooling system of water-based antifreeze after draining and before installing new waterless coolant. Prep Fluid should be used when block drains are unavailable or cannot be removed. Purge your cooling system with our specially formulated Prep Fluid. 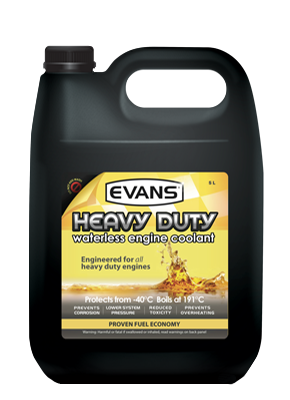 Evans Heavy Duty Coolant is ready to use—no water required. It contains no silicates or phosphates and requires no Supplemental Coolant Additive (SCA). To ensure success using Evans High Performance Coolant, follow the recommended installation procedure. Evans recommends that Prep Fluid be used to purge the system after draining out the old coolant.